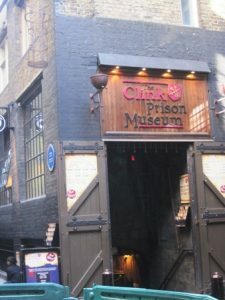 The Clink is a museum on the south bank of the River Thames between London Bridge and Southwark Bridge. It recreates conditions in the infamous medieval Clink prison which functioned in Southwark between the 12th century and 1780 when it was burnt down in the Gordon riots. The museum has on display torture devices, waxworks of debtors and heretics and also has various interactive exhibits. The museum is open every day and there is a charge for entry. In medieval times the nearby church, which was later to become Southwark Cathedral, was a favourite place of sanctuary to those fleeing the city’s justice and the area acquired an unsavoury reputation and also being the home to much of London’s entertainment – theatres, bull baiting, bear baiting, houses of ill repute and inns. By the seventeenth century there were seven private prisons in the area including the Clink which has given its name to the slang word for a prison. Private prisons were very lucrative businesses. The Clink was owned by the Bishop of Winchester and was located next to his palace. The Bishop was a very rich man who, amongst other things, ran the prostitutes in the area who became known as Winchester Geese. The remains of the Great Hall of the Bishop’s palace can still be seen to the east on the corner of Clink Street and Stoney Street.